The field of view is narrow and the surroundings are distorted. How about making the lens larger? This review is about item#6789973. Since the irradiated position of the LED is exactly good, the flaw is relatively easy to detect. I think that the price is reasonable. After purchasing, contact failure of the switch will occur about half a year. Nature observation · Maintenance of tweezers etc. It is a good product from the price. As compared with other companies made of plastic aspherical lenses, this product of glass lens is higher in lens performance. Just because the LED is bluish strongly, I want to have it a little more neutral white, I want a device to spread so it gleams because it is too bright. When I installed the LED light diffusion cap I got at an electronic parts specialty store, it became easier to see. It is convenient for observation with light on. It's even better if you have a lens with a higher magnification. I use it as a magnifying glass. There is no extent of expansion as I thought If you do not use it quite closely, the letters will look inverted. Although the circumference aberration is intense although it is reflected, it is a level which is not problem for my own use. It is useful when you read the small engraved mark of the carburetor jet. 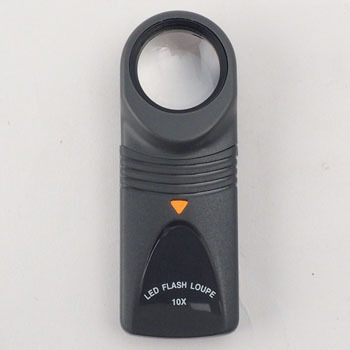 The light is too bright and the magnification is high for small lens diameter, so it is very hard to see. Check the finish condition of the cutter's polishing work Sometimes it is easy to use, as it purchases, enlarges as well as lighting. This review is about item#06789973. It is made in Taiwan, but the instructions of Monatarou are attached properly. You will know that you are selling it as a person using it. It is palm sized, always being in the waist pouch and using it for nature observation, fine confirmation of parts etc. It is very handy. Presbyopia has become more severe and I tried purchasing it, but it is compact and does not get in the way and is useful. Since it has a light, it is satisfactory enough to see very fine parts. It is used when confirming details of parts processing of mold parts. The price is cheap anyway. Loupe can also be enlarged as usual. Even if you use the LED in a bright and dark place, you can see clearly. The process confirmation work became very easy. I also understood the wear condition of the blade well. It is about too much to see.